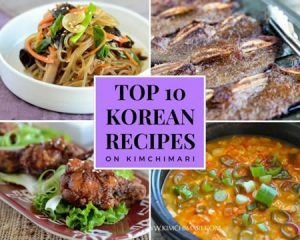 Vegan and gluten-free Korean recipes that you can easily make at home, including salads, side dishes, rice and noodles, desserts, and even kimchi. 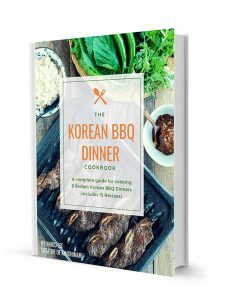 So you can make a whole meal with these recipes and now everyone can enjoy Korean food! Just because you’re on a vegan and/or gluten-free diet doesn’t mean you should miss out on Korean food! 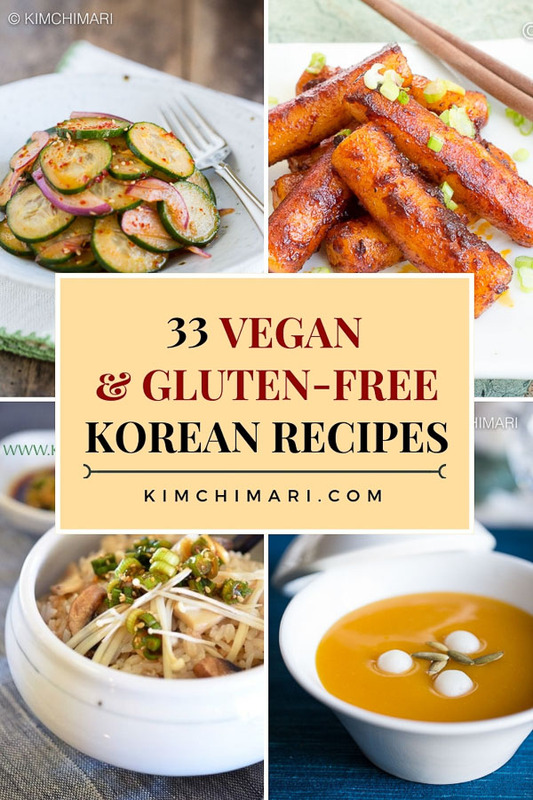 Or if you have a friend or family member who’s on a vegan and gluten-free diet, let them know about these great vegan and gluten-free Korean recipes that can be done at home with simple ingredients. 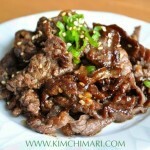 Unless it’s a meat-centric dish like Beef Bulgogi or Kalbi, Korean dishes are quite easy to make into a vegan dish. Japchae, Soft Tofu Stew, Kimchi Jjigae are some recipes that have both meat and vegetables but just omit the meat and it can still be tasty. My one-pan Japchae is a great example. Traditionally, meat is added but I made this dish without meat and it tastes just as good if not better. Meat substitutes – Shitake (especially dried) and King Oyster mushrooms are great meat substitutes. And so is protein-rich tofu of course. Vegan Broth – make a broth by simmering kelp (dashima 다시마), dried shitake mushrooms, onions and green onion roots. They will provide great umami-packed broth for any recipe where anchovy or beef broth is used. Vegan Kimchi – many people think you can’t make vegan kimchi because fish sauce is a must. Fish sauce is NOT a must in kimchi making. You can use Korean soy sauce for soups (Guk Ganjang/Chosun Ganjang) instead of fish sauce along with some kelp broth. Check out my Know your Soy Sauce post to learn about more about Guk Ganjang and all other types of Korean soy sauces and what to buy. There are also some wonderfully authentic vegan kimchis (see below) that don’t even use Guk Ganjang but made with just salt and other aromatics (i.e. cucumber kimchi). Many Korean recipes are naturally gluten-free. The areas where you will have gluten issues mostly will be the use of flour in making jeons and buchimgae (pancakes), noodles and dumpling wraps. Use Rice Flour or Gluten Free Flour – for dishes that use flour, just substitute it with GF flour or a mix of rice or sweet rice flour. Use Gluten Free Soy Sauces – if you are absolutely allergic to gluten then you need to watch out for Soy Sauces that contain gluten or wheat. Jin Ganjang or common soy sauces like Kikkoman can contain wheat. Note that Korean soup soy sauce (Guk Ganjang) is almost always gluten-free, but check the label to confirm. Look for the information on the label or in the list of ingredients. Tamari, though not Korean, it tastes similar and is usually gluten-free. Rice Cakes for soups (Tteokguk Tteok) and Tteokbokki are all supposed to be 100% rice but sometimes the cheaper versions will have a mix of wheat flour with the rice flour. Make sure you buy ones that have rice only. 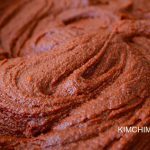 Gochujang and Deonjang – made traditionally the right way, it should not contain any gluten but many of the storebought products may have ‘wheat extract’ in them. It doesn’t cause any issues for me (as I don’t have celiac but just sensitive) but you should be aware in case you are ultra sensitive to allergic to wheat products. Chungjungone Gochujang has a gluten-free bottle that you can buy from my store on Amazon. 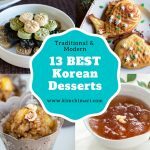 Here, I have put together more than 33 vegan and gluten-free Korean recipes to get you started – from kimchi to desserts! Cabbage Kimchi with Apples and Ginger – Inspired by Korean temple cooking. No fish sauce, garlic, or green onions. 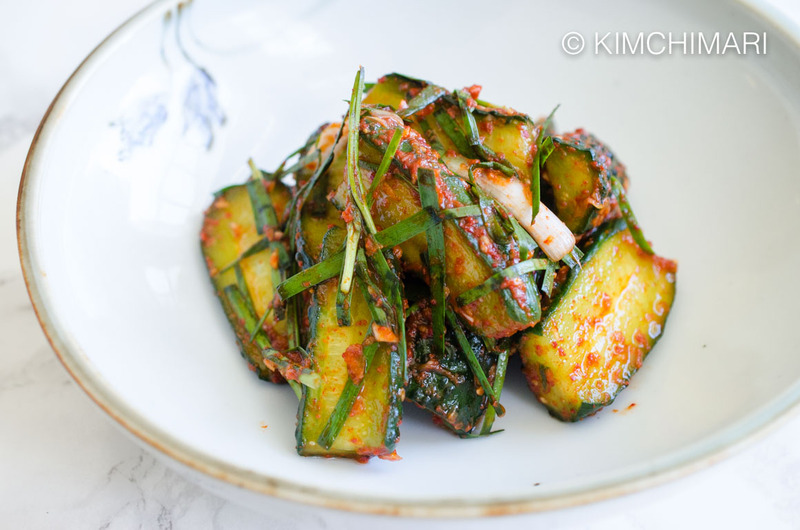 Cucumber Kimchi with Chives (pic above) – Light and refreshing, it’s the summer kimchi of all kimchis. Water Kimchi with Watermelon Radish (Mul Kimchi) – A kimchi you can “drink” for belly-cleansing deliciousness. 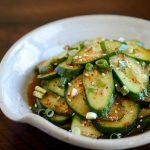 Quick Asian Cucumber Salad without Soy Sauce – No soy sauce, garlic, or green onions. Ready in 5 minutes. 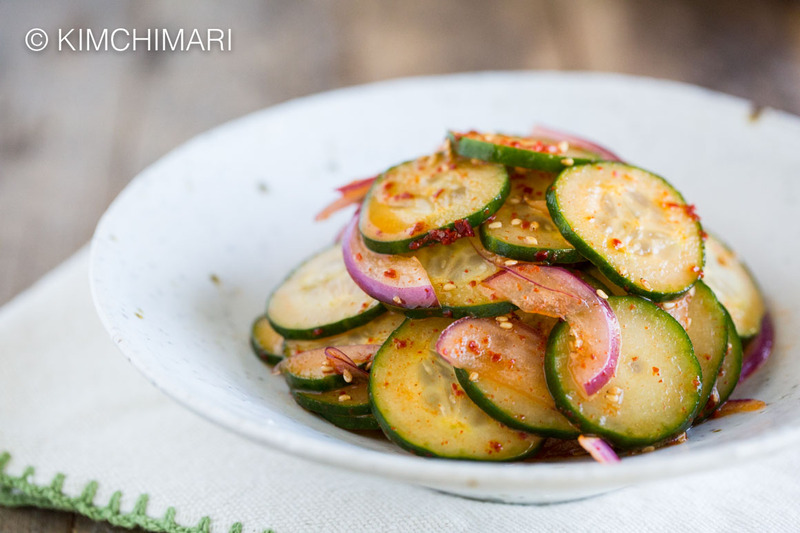 Simple Korean Cucumber Salad (Oi Muchim) – A light seasoning allows the refreshing cucumber flavor to stand out. Korean Radish Salad (Moo Saeng Che) – Sweet, tangy, and slightly spicy. Best of all, beneficial to digestion. 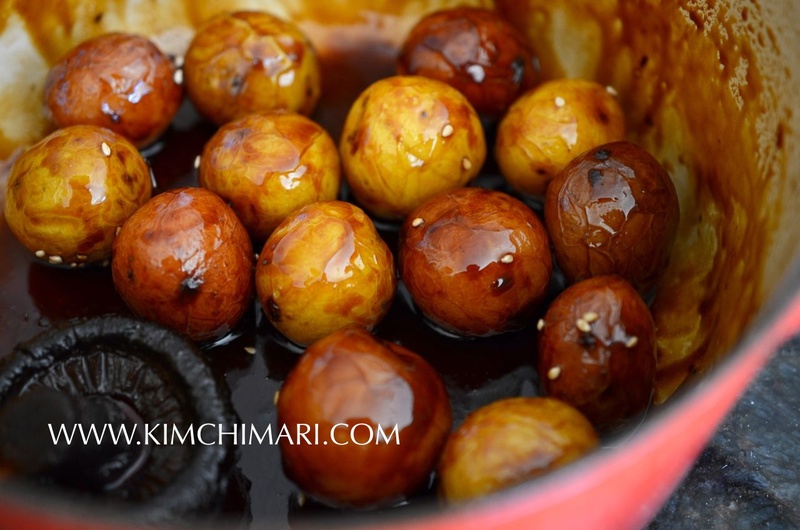 Dried Zucchini Side Dish (Hobak Namul) – A uniquely Korean zucchini dish that uses dried zucchini slices. Three Color Vegetables – Three traditional Korean side dishes that add color and variety to a meal. 3 Quick Korean Side Dishes – Each dish takes only 5 to 10 minutes. Great for parties. Sweet and Salty Braised Lotus Roots (Yeonkeun Jorim) – A good way to enjoy the texture of lotus roots. Korean potato side dish (Gamja Jorim) all cooked! Korean Potato Side Dish (Gamja Jorim) – Baby potatoes are recommended for this recipe to maximize the taste and texture. Easy Potato Fritters – A potato lover’s dream: crispy on the outside, and pillowy soft on the inside. Crispy Korean Potato Pancakes (Gamjajeon) – An excellent snack option made simply with grated potatoes. 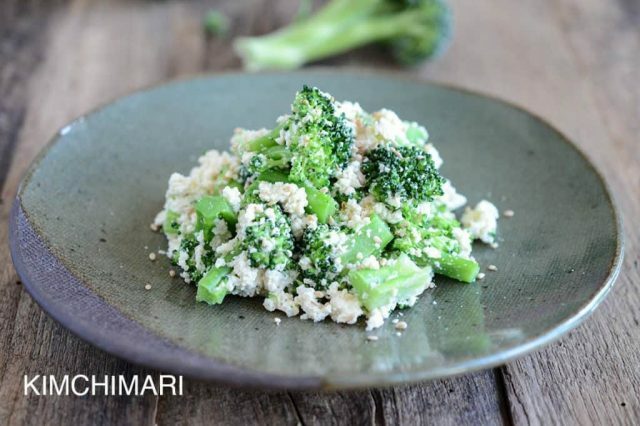 Broccoli Dubu Muchim – Simple and light, this recipe allows the true goodness of tofu to shine. Tofu Braised in Soy Mirin Sauce – Tastes great both warm and cold. Can be made ahead and leftovers can be stored in the refrigerator for days. Sweet and Salty Soybeans (Kongjaban) – Cooked correctly, the black soybeans should have just the right bite. 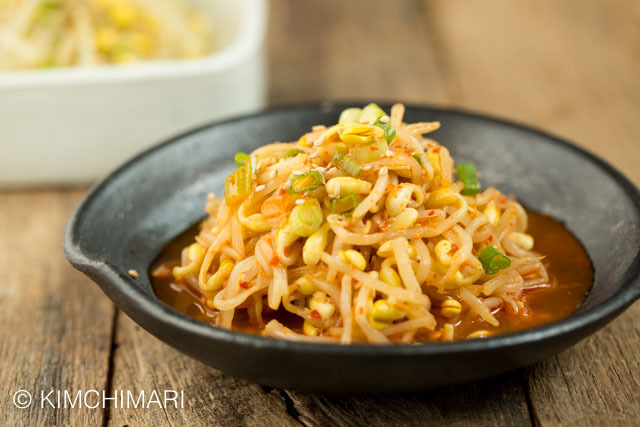 Spicy Soy Bean Sprouts (Kongnamul Muchim) – This alternative to the popular bean sprout side dish is saucy and has a kick! 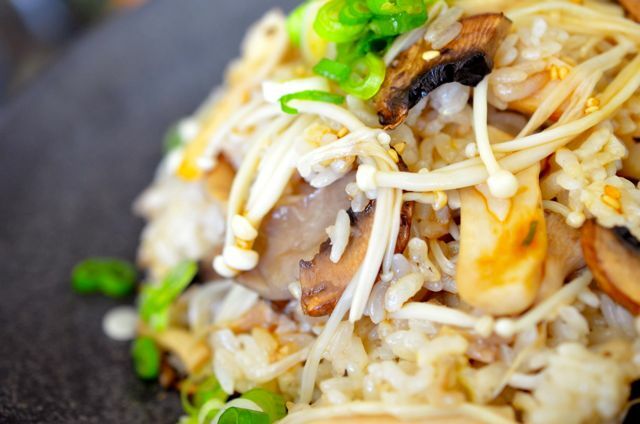 Korean Four Mushroom Rice in Stone Pot (Beoseot Bap) – A one-pot rice dish that highlights the mushroom flavors in a wonderful way. 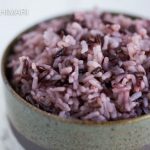 Korean Purple or Black Rice (Heukmi Bap) – Besides giving normal rice a beautiful purple hue, black rice adds a nutty flavor and extra health benefits. Korean Multigrain Rice (Japgokbap) – Includes grains and beans like sorghum, millet, red or black beans, and chickpeas. One-Pan Korean Glass Noodles (Japchae) – Easier and faster to make than the traditional version but just as flavorful. Mini Kimbap with Carrot or Cucumber (Mayak Kimbap) – Korean seaweed roll is a convenient finger food that everyone loves. ➡️Rice cakes (Tteok) are naturally gluten free if properly made. Rice Cakes with Chili Oil (Gireum Tteokbokki) – Sauteed in chili oil and soy sauce. Simply addicting! 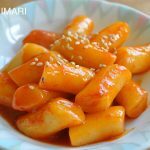 Spicy Rice Cake (Tteokbokki) – The simplest and easiest Korean rice cake recipe ever. 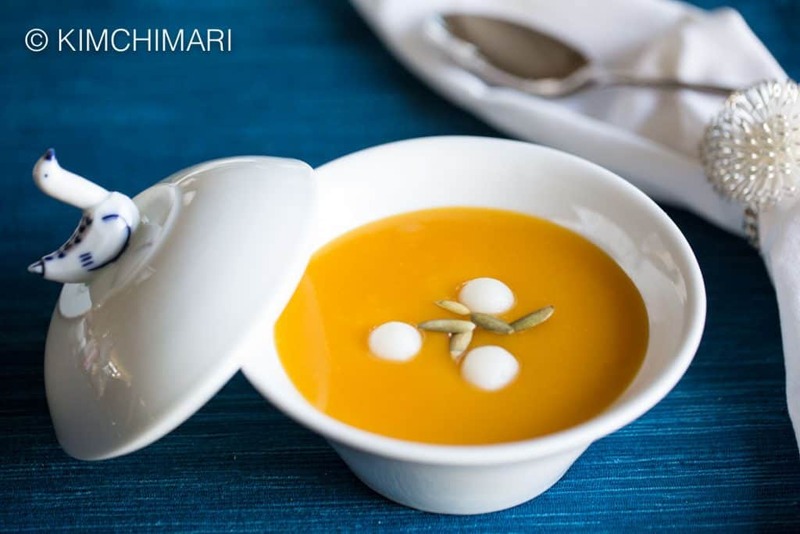 Pumpkin Porridge (Hobakjuk) – Light on the stomach and full of nutrients, this is a yummy healing dish. Black Sesame Porridge (Heukimja Juk) – A belly-warming favorite full of fiber, calcium, and minerals. 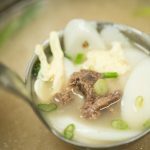 Korean Cold Cucumber Soup (Oi Naengguk) – Low in calories and loaded with minerals that will help you stay hydrated on a hot day. Sweet Rice Cake Dumplings with Sweet Red Beans (Bukkumi) – Sweet Rice dumplings stuffed with sweet fillings and then pan-fried in oil to create a crispy crust with a soft chewy inside. 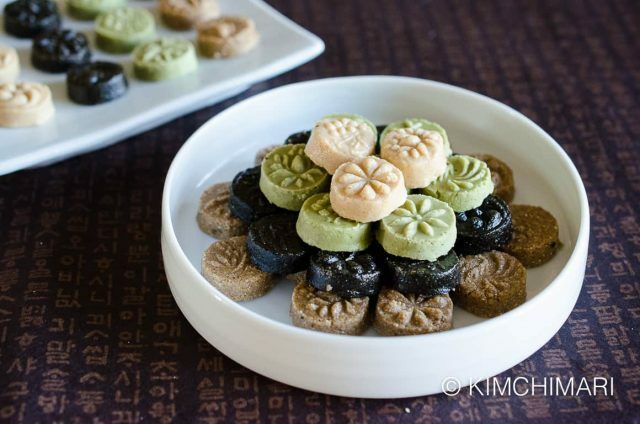 Korean Tea Cookies (Dasik) – No-bake gluten-free cookies made with ingredients like black and white sesame seeds, green matcha, soybean and rice flour. Substitute maple syrup or corn syrup instead of honey to make it ultra vegan. Korean Sponge Candy (Dalgona) – Sugar, baking soda is all you need to make this childhood favorite. Korean Sweet Rice Dessert (Yaksik) – A dessert filled with health-promoting ingredients like jujube, chestnut, and pine nuts. 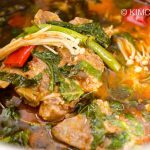 Also get the Instant Pot Yaksik recipe. Cinnamon Ginger Punch (Sujeonggwa) – a wonderful cold dessert drink made from cinnamon and ginger water mixed with sugar that is not just yummy but also great for keeping the cold away! 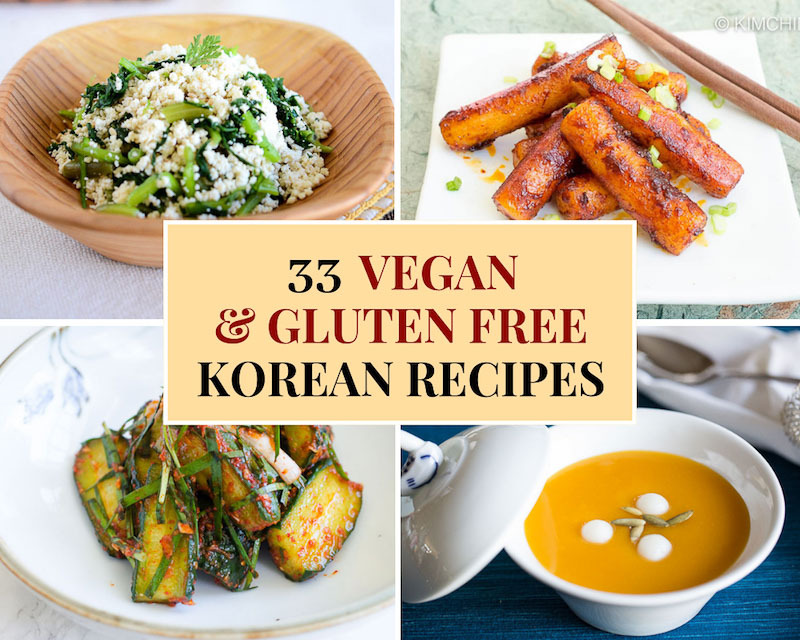 Well, I hope these vegan and gluten-free Korean recipes will help make your life healthier and happier! And please share them with your vegan and gluten-free friends and family!! 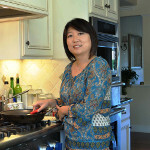 You can also FOLLOW ME on FACEBOOK, PINTEREST, and INSTAGRAM, or join my FACEBOOK GROUP to connect with other Korean food lovers. « Kimchimari Monthly GIVEAWAY- We HAVE A WINNER!